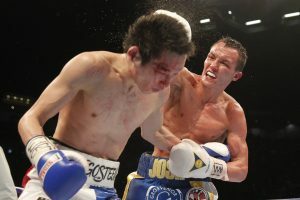 Any hopes for Josh Warrington to land in a featherweight title unification bout will have to wait at least one fight longer. Barely two weeks removed from his thrilling points win over former two-division champ Carl Frampton, the unbeaten Brit has been issued his marching orders for his next title defense. It won’t be a unification bout with the likes of Oscar Valdez, Leo Santa Cruz or Gary Russell Jr., rather a clash with mandatory challenger Kid Galahad. Word came down on Monday from the International Boxing Federation (IBF), whose featherweight title Warrington claimed in a 12-round win over Lee Selby last May. “(Josh) Warrington has been ordered to next face (Kid) Galahad,” IBF spokesperson Jeanette Salazar confirmed to BoxingInsider.com. The two sides will have 30 days to negotiate terms for such a bout, or else will be subjected to a February 6 purse bid hearing. At any time during such talks, either side can request an immediate purse bid in the event it’s clear that there isn’t any chance of reaching a deal. There are several layers to peel back regarding such talks. Warrington is with Frank Warren’s Queensberry Promotions, while Galahad (birth name Abdul Barry Awad) fights under Eddie Hearn’s Matchroom Boxing banner. Warrington (28-0, 6KOs) signed with Warren in 2017, shortly after parting ways with Hearn with whom he worked with for the prior three years. Warren has network deals with BT Sport in the United Kingdom as well as ESPN’s streaming platform—ESPN+—in the United States, while Hearn has for years worked with Sky Sports and the primary content provider for sports streaming service DAZN. Both boxers were last seen fighting on the desired platforms of their respective promoters. Warrington’s instant classic with Frampton topped a December 22 bill which streamed live on ESPN+ for stateside viewers, while playing to Pay-Per-View in the U.K. Warrington prevailed via unanimous decision in the first defense of the title he snatched from Selby, capping a breakout year for the Leeds boxer. Galahad (26-0, 15KOs) earned his way to a title shot following a 12-round win over Toka Khan-Clary in their title eliminator this past October. The bout took place in Boston, marking Galahad’s stateside debut along with his first appearance on DAZN. The unbeaten 28-year old has since resurfaced in a stay-busy bout, scoring an eight-round shutout of Brayan Malrena in his adopted hometown of Sheffield on December 8. The bout came in supporting capacity to Sheffield’s favorite son, former welterweight titlist Kell Brook whom outpointed Michael Zerefa atop the Sky Sports-aired/DAZN-streamed telecast. While there have been past instances where a defending titlist can bypass a mandatory defense in favor of an approved unification bout, such a scenario will not apply to this contest. Warrington was already mandated to face Galahad by the time he stepped into the ring to face Frampton in a voluntary defense. The aforementioned bout came with the blessing of the IBF on the condition that he would next defend versus Galahad. Neither boxer can take a fight in the interim. Assuming neither party backs out, the contest will likely take place in early spring. Where it lands will, of course, depend entirely upon which side secures promotional rights. As both sides come in armed with lucrative deals from platforms eager to secure as much content as possible, nothing short of a bidding war is expected.